Each year CKAP members participate in challenges for 7 awards. The awards and links to award winners are as follows. Scroll down this page for more details of each award. A description of the awards follows. The Canadian Olympic Goal Trophies are engraved with the names of the female and male Canadian cyclists with the highest annual kilometers for a calendar year. The Pauline McKinley International Olympic Goal Trophy is engraved with the name of the cyclists with the highest annual CKAP kilometers for a calendar year for a woman regardless of country. The International Olympic Goal Trophy is engraved with the name of the male cyclist with the highest annual CKAP kilometers for a calendar year regardless of gender or country. 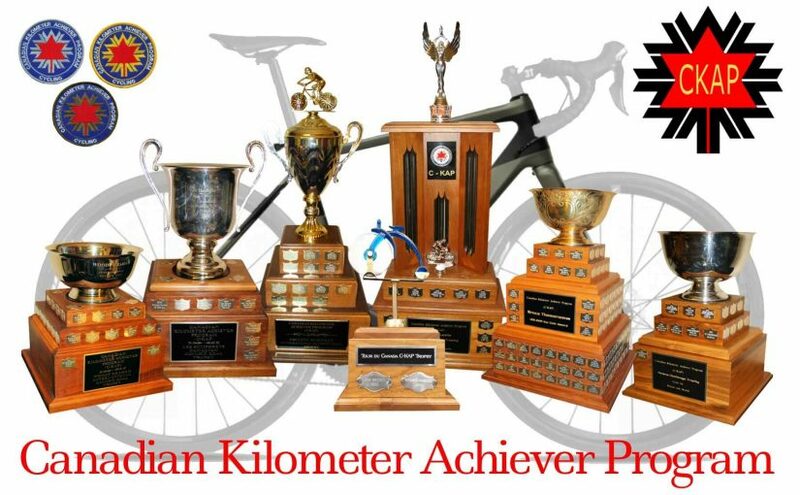 A Bruce Timmermans 100,000 Km Club Member keeper plaque and certificate will be awarded to each CKAP member who has cycled 100,000 CKAP recorded km, at no charge. A new plaque will be presented each time the same member cycles another 100,000 CKAP recorded km. Awarded to the Cycling Club – Network – Group with the highest CKAP annual km. This award recognizes the collective participation of cycling. A free keeper plaque and certificate is awarded to the cycling club, network or group that has the highest annual CKAP registered km. Each CKAP member cyclist must choose one cycling club in which they are a member for their km to count towards the Hewes Club Challenge. Each club or group must have a minimum of three CKAP members to count towards a win. Clubs with less than three CKAP members’ logs will be listed after those that have the minimum three CKAP members, but cannot win regardless of their total km. Please remember to include this information on your yearly cycling log. Please encourage your fellow club members to sign up for CKAP. There will be only one Hewes Challenge Trophy for all programs. As a member of CKAP you will be able to count your annual km towards any cycling clubs that you may belong to. Handcyclist must choose if they wish to participate in the Bicycle or Special Needs Incentive Programs depending on their ability, by indicating their choice on the CKAP registration form and annual cycling log. All awards will show the actual km levels reached in the program you have chosen. Members of the handcycling program may switch from one incentive program to the other if ability warrants the change by informing the CKAP Coordinator by email or post. There is a wide range of human powered vehicles and various abilities of Special Needs cyclists. Because of this, members of the Special Needs Program may choose to participate in either the 25,000 km Incentive Program as shown above, or the 15,000 km Incentive Program shown below. You must indicate your choice on your CKAP Registration Form and Annual Cycling Log. All certificates and engraved medals will indicate the actual km level you reached in the program that you choose. You may switch from one program to the other if your ability warrants it. This must be done by written request sent to the CKAP Coordinator. Given to a CKAP member for exploring Canada by bicycle. This award is determined by Tour du Canada. CKAP members submit details of kilometers ridden in Canada (outside home province) on their annual log form. Both Tour du Canada and CKAP recognize that Canada offers the best cycling conditions in the world and these national organizations wish to encourage cyclists to explore Canada’s many regions. The award has been donated to CKAP by Tour du Canada, a national network of cyclists whose mandate includes the promotion of interprovincial cycling. This award will be presented annually to a CKAP member who travels in the greatest number of provinces and the greatest distance in Canada each year.